In 1883, Henry Tallmadge received patent #288679 for this unique head tightening arrangement. They have been found on banjos bearing his name and on no-name instruments. This is one perhaps you can help with. The intertwined letters could be L&H. Lyon & Healy advertised a Star brand banjo circa 1890. Anyone have a banjo with this mark that's clearer? Stromberg-Voisinet, established in Chicago as the Groeschl Company, they changed the name in 1890. Not to be confused with the Boston Strombergs, they manufactured a line of low to medium grade fretted instruments for jobbers and wholesalers. The cast flange with its alternating perforation pattern is a clear indicator of these banjos. In 1931 they changed the company name to Kay. Slingerland, while in business making drums from 1916 until the present, only made banjos from circa 1918 to 1944 and seems to have produced the bulk of student and mid-range instruments during that period. This peghead is found on tenor, plectrum and 5 string models, often with no name at all. If present, the Slingerland name will usually be found stamped on the strut while the seller's name, if any, will normally be on the peghead. Maybell was a Slingerland brand name. This peghead is found on low end, turn of the century, Lyon & Healy banjos, often with the L&H or Mystic brand stamped into the strut. Many have no identification at all. Most have the patented L&H tailpiece shown in the inset. These shoes are shown in an 1890s Washburn banjo catalog, on low end models with simple peghead shapes. Many seen have no identification at all. Also, the tailpiece on this banjo is a patent assigned to Lyon & Healy, further suggesting them as the makers. 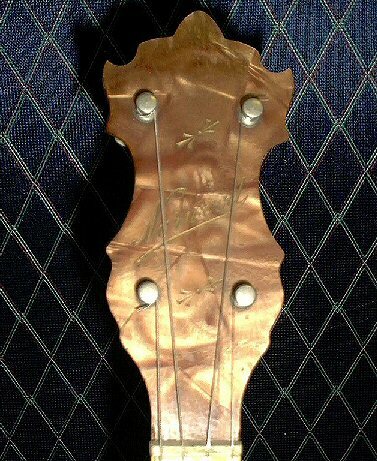 Tailpieces were sold as after-market products and are easily transferred from one banjo to another, so do not constitute "proof" but they are often suggestive. This integrated shoe and flange, patented in the 1930s, is found on low end tenor and plectrum banjos made by the Regal Company of Chicago, IL. No 5-string models have been seen. 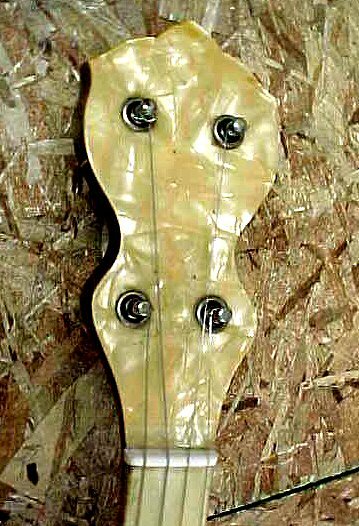 This shape is sometimes seen with the Rex or Clarophone name, both Gretsch company brands, on student grade banjos, but most often with no maker or brand designation.. They were the likely maker, but it is possible that in the 30s they farmed the work out and simply labeled the instruments. A similar peghead design is found on Gretsch's all metal rim sold variously as the Orchestrella and the American. This peghead is often seen on banjos, guitars and mandolins. Sometimes marked Old Kraftsman, Kay Kraft, plus variations and others, but just as often with no name at all. They were made by the Kay Company, Chicago, IL, who were in business 1931 to 1968 making student grade instruments for the most part. Many 1940s and '50s banjos came out of the Gretsch factory with different or sometimes no markings at all. This resonator appears on many of them, sometimes with a minor variation in the sound holes in the flange. But the press on style is a strong indicator that Gretsch was the maker. This peghead is found on banjos, often with no name at all, but sometimes with any of several other names. They were made by the Kay Company, Chicago, IL, or their predecessor Stormberg-Voisenet. 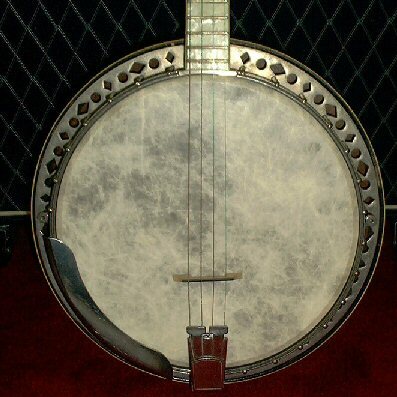 This resonator is found on banjos, often with no name at all, but sometimes with any of several other names. As with the above peghead, hey were made by the Kay Company, Chicago, IL, or their predecessor Stormberg-Voisenet. This peghead was found on a banjo with a Harmony Company, Chicago, IL, label. Often they are unmarked from the start or the decal rubs off. See next resonator. 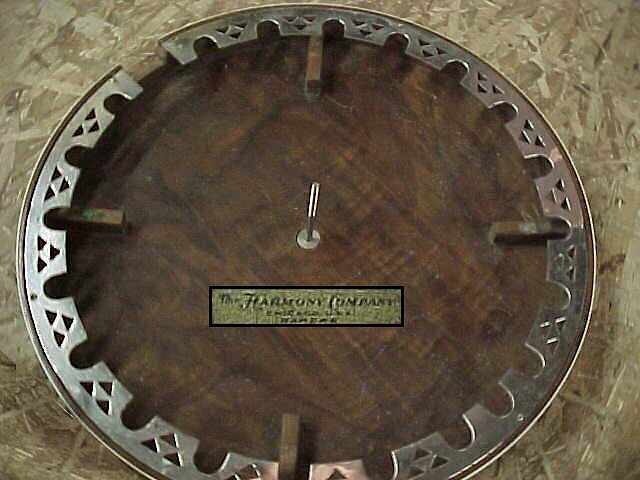 This resonator was found on a banjo with a Harmony Company, Chicago, IL, label. See label. Thanks to everybody who provided information and pictures.